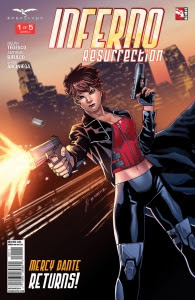 The Fellowship was fortunate enough to obtain a copy of INFERNO: RESURRECTION #1 from Zenescope Entertainment. Ralph Tedesco writes, Antonio Bifulco draws, Erick Arciniega colors, and Jim Campbell letters. A while back, Mercy got a second chance. She went to Hell and Lucifer offered her a deal – a return ticket to Earth to complete a task, and to send escaped demons back to Hell. A dangerous gig, to be sure, but she tries to be careful. But there’s something happening that she’s about to get dragged into, and it might just be the death of her. Mercy also has a conscience, which has not always been the case, as she tells it. She does the right thing, even at great personal risk. That’s a “good guy” trait, which will surely come in handy considering what she’s dealing with in this book. And she’s got something to lose, which helps keep her real to readers. And the art has a strong realistic feel to it, with some really nice detail points scattered throughout the book. This is the start of a really nice redemption story. And who can resist the irony of “Mercy” working as a tool of Lucifer? Not me, that’s for sure. INFERNO: RESURRECTION #1 is available now at your FLCS or at zenescope.com.